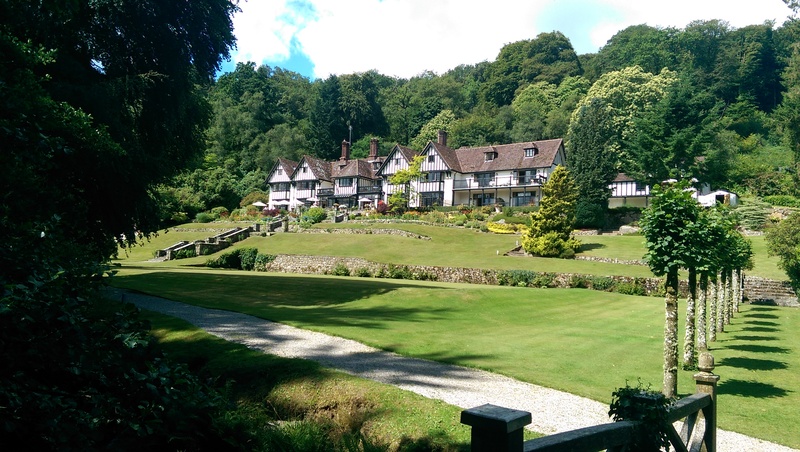 Gidleigh Park describes itself as a quintessential country house, with its imposing old trees, tranquil stream and Arts and Crafts good looks you would be hard pressed to disagree. It sits near Chagford in Dartmoor National park and requires some hairy driving to get you there down narrow country roads. The restaurant offers a signature tasting menu (£140) and la carte menu (£115 for 3 courses) in the evening and a cheaper (£57 for 3 courses) lunch menu, which is what we ate. The dining room was a spacious wooden affair befitting of the rest of the house. We were the first to be seated which meant the atmosphere was a little lacking. The surroundings are perhaps a little more formal than is conducive as despite the restaurant getting busier it didn’t quite have that buzz. 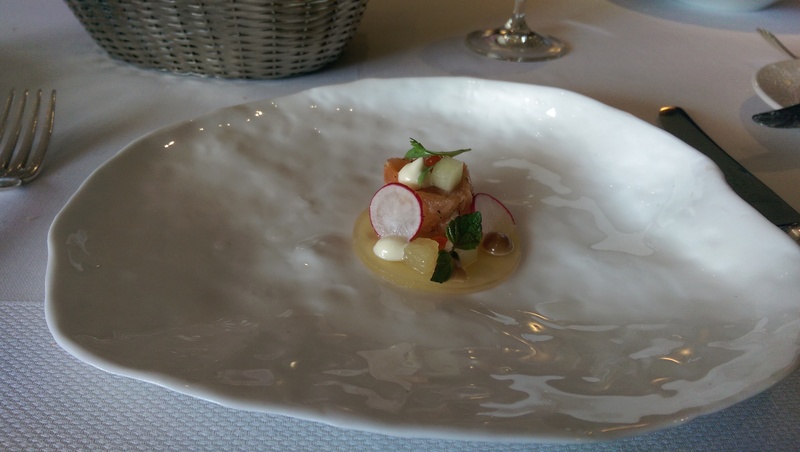 A little starter came before the main; a salmon tartare arrived on the biggest plate I’ve ever seen which captured my interest as equally as the food! The salmon though was good quality, and melted in the mouth the odd explosion of soy and wasabi elevating the flavours. The first course proper had seen my chose the vegetarian option of parmesan gnocchi. I enjoyed the forest floor presentation and in addition to the perfectly cooked gnocchi there was lots going on. The main additional accompaniment some little quails eggs, the runny yolks adding richness to the dish, mushrooms completed the aforementioned forest vibe and some crisp potatoes added a welcome textural change. My main of Dartmoor lamb I didn’t think was as attractive, a little too much going on on the plate. 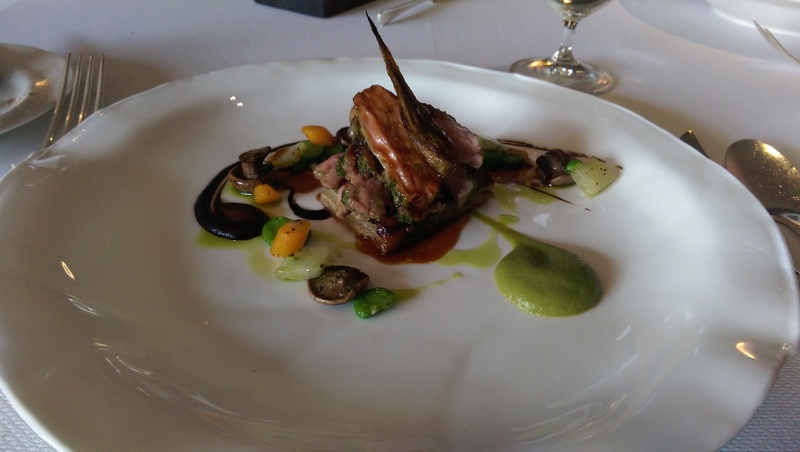 The lamb itself was accurately cooked although suffering from the same fate of the presentation, tapenade jus and fennel puree fighting with the relatively subtle, delicate meat. Boulangère potatoes with confit shoulder cut through them was probably the most skilful piece of cooking on show. 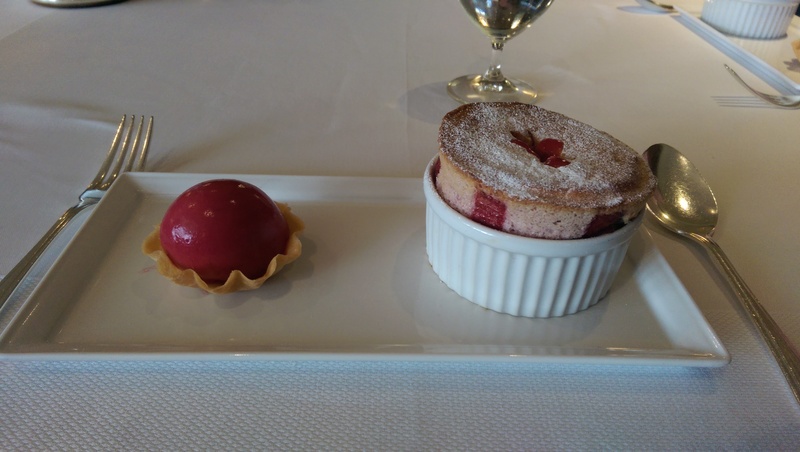 Raspberry soufflé, I’m sure you’ll agree, was a stunner. A warm raspberry jus was poured into the pillowy soufflé, adding that extra flavour that can be lacking. No flavour lacking here though, a perfectly smooth sorbet added the final raspberry element and completed a very accomplished dessert. Petit fours were arguably the most memorable section of the meal. Usually a chocolate truffle or two arrives, maybe some macaroons or beignets, not here. 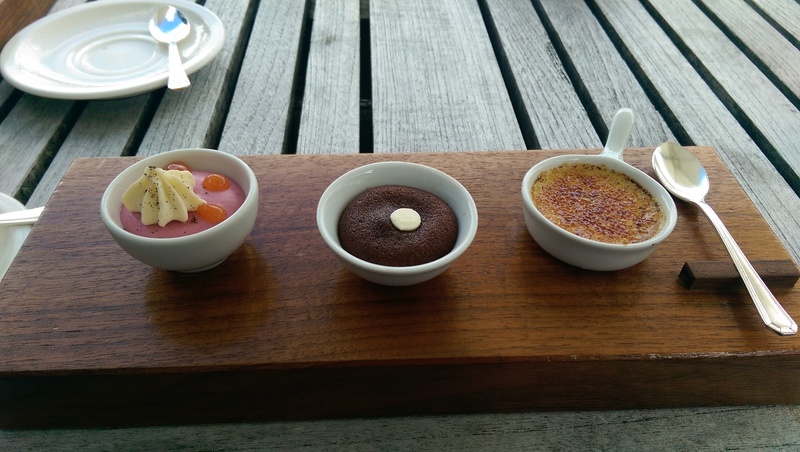 Three little treats of a blackcurrant mousse, chocolate fondant and crème brûlée. 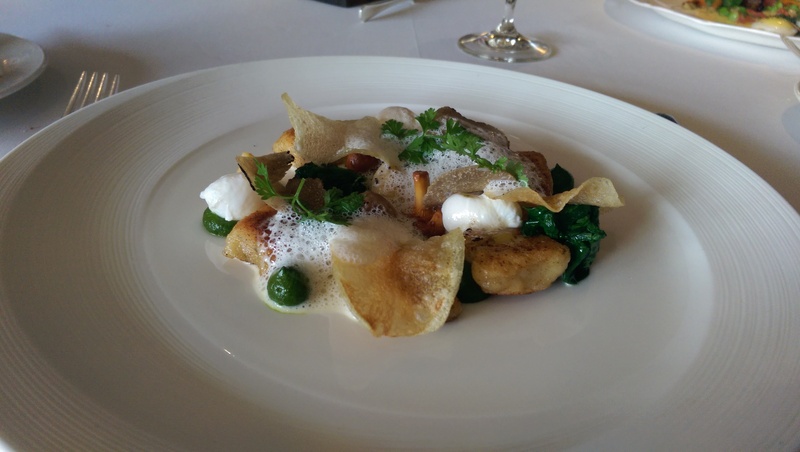 And that is where Gidleigh impressed, the lunch menu may not have carried the luxury ingredients of its evening counterparts but the bells and whistles exceeded my expectations. A moderately disappointing main aside I enjoyed the afternoon and surroundings, I’d happily return to a livelier evening dining room to try the full menu.